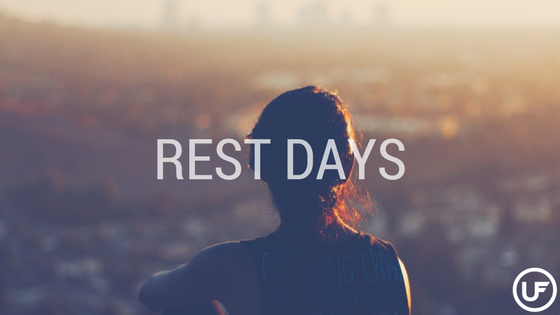 Rest Days. Take a moment to ask yourself how many days off you take each week. I don’t mean doing cardio for 30 minutes, I mean completely off. You may be the ambitious type who’s in the gym every day, sometimes more than once. If you’re feeling burned out, unmotivated, or are not performing well, consider adding more rest to your schedule. ● Your muscles grow when you rest. Lifting creates micro tears in muscle fibers that repair during rest. This is when your muscles become stronger. Yes, it’s important to work your muscles hard but it’s equally as important to give your body enough time to recover. ● More free time. Hitting the gym for lengthy workouts every day is a big time commitment. It’s important to make time for other quality-of-life boosters too, such as hanging out with friends and family, learning something new, and having “me” time. ● Less moodiness. Exercise can be a potent anti-depressant but too much can have the opposite effect, causing anxiety over demanding workout schedules and feeling run down. ● More energy throughout the day. If you’re crashing in the afternoon or dragging during the day because you’re so tired and sore you can barely move, you’re doing too much. ● Better quality of sleep. If you need excessive sleep to fuel your workouts or are unable to sleep even when you’re very tired, both are indicators that something is wrong. ● Avoiding burnout. We all have limited resources: time, energy, money, physical reserves. Spending too much of them on exercise can lead to burnout. Exercise is a lifelong pursuit, and it should make you happy. Find a balance that works for you and your life. If you’re worried about losing strength or gaining fat during rest periods, consider this: If you spend 11.5 months out of the year getting in shape, how much fitness can you honestly lose in 5-14 days? Very very little. In fact, you’ll probably come back stronger than before. Even in terms of fat loss, you can still get lean when taking a break from training if you keep an eye on your caloric intake. Deload. Almost all athletes take periods in their training to reduce one or all of the following factors: volume, intensity, and frequency. Typically, you’ll want to train intensely for 3-6 weeks then take a deload week. In addition to deloading, it is recommended to take a full week off from training after every 3 cycles (18-24 weeks) of continuous training. Longer cycles of 16-18 weeks are often followed by periods of 5-10 days completely off from training. During this time, make it a priority to do something completely different. Stay out of the weight room, do bodyweight circuits in the park, hike, or swim. Don’t be afraid to do some easy training every 3-4 months to give your body and mind a break, you won’t lose anything and you may find that you gain a lot (both physically and psychologically) when you come back to the gym.